If you have any questions about the NOBLE HOUSE information page below please contact us. Sensation Yachts New Zealand completed the building motor yacht NOBLE HOUSE in 2005. Therefore, she has the distinction of being built country of New Zealand. 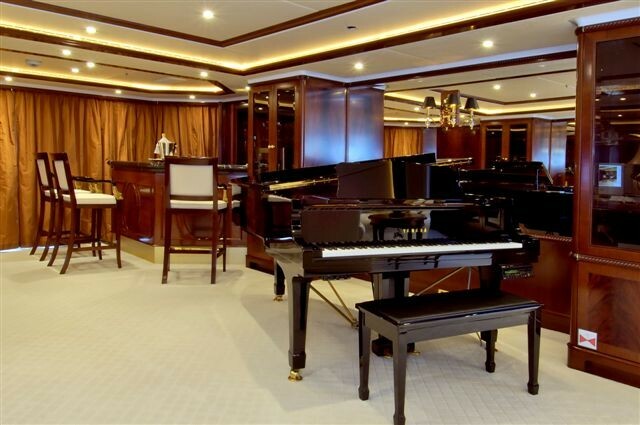 NOBLE HOUSE had yacht design work completed by Sensation and Jon Overing and Sensation. This superyacht NOBLE HOUSE can sleep overnight a maximum of 12 aboard together with around 12 professional crew. Launched to celebration for 2005 the comparatively recent interior design proffers the design knowledge of owner and Zuretti Interior Design / Mitchell Rubin. 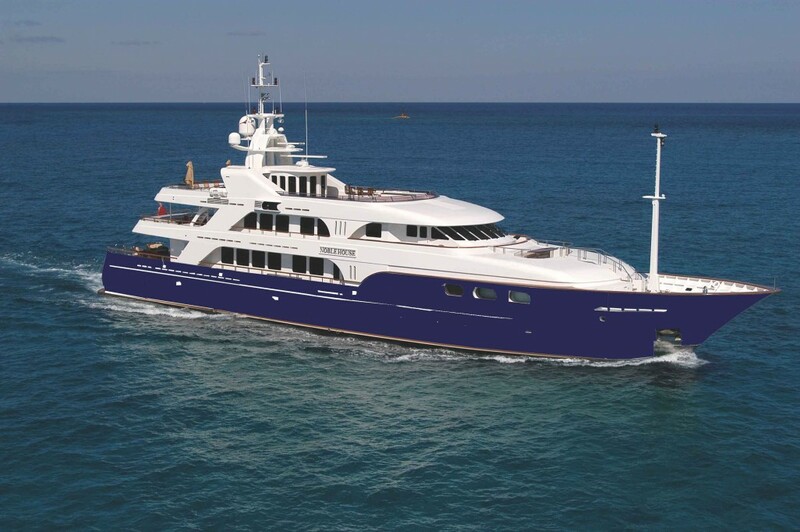 Sensation was the naval architect firm involved in the technical superyacht plans for NOBLE HOUSE. Also the company Sensation and Jon Overing expertly collaborated on this project. Interior designer Zuretti Interior Design / Mitchell Rubin was commissioned for the creative interior styling. New Zealand is the country that Sensation Yachts New Zealand constructed their new build motor yacht in. After the formal launch in 2005 in Auckland the boat was handed over to the happy owner having completed final finishing. A spacious proportion is manifested with a widest beam (width) of 9.75 m / 32 ft. With a 3.38m (11.09ft) draught (maximum depth) she is reasonably deep. The material steel was used in the building of the hull of the motor yacht. Her superstructure above deck is fashioned out of aluminium. In 2006 further refitting and modernisation was in addition finished. The 3516B DITA engine installed in the motor yacht is made by CATERPILLAR. Connected to her Caterpillar engine(s) are twin screw propellers. The engine of the yacht generates 2200 horse power (or 1950 kilowatts). She is fitted with 2 engines. 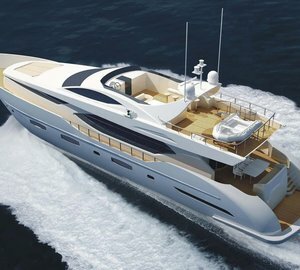 The combined output for the yacht is 4400 HP or 3900 KW. Apportioning cabins for a limit of 12 welcome guests overnighting, the NOBLE HOUSE accommodates everyone in luxury. Normally the vessel uses circa 12 expert crew members to operate. 52.85 metres / 173.39 feet. Giving the combined power of 4400 HP /3900 KW. 12000 at a speed of 12 knots. During Sept 2009 NOBLE HOUSE cruised Mangonia Park, in United States. This motor yacht has traveled the cruising ground near Palm Beach County during Sept 2009. JDNall or Aqua Air is the air conditioning in the interior. 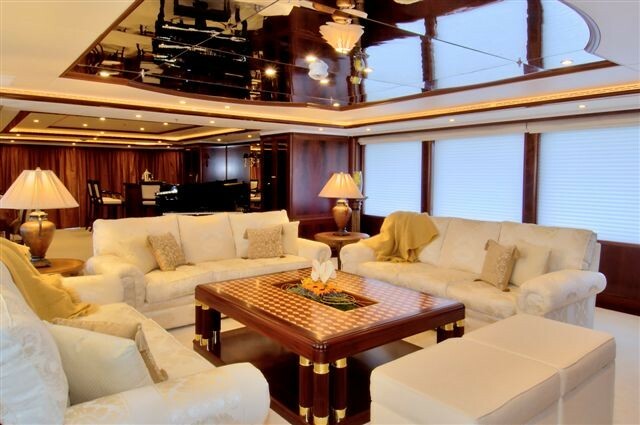 This motor yacht has a teak deck. 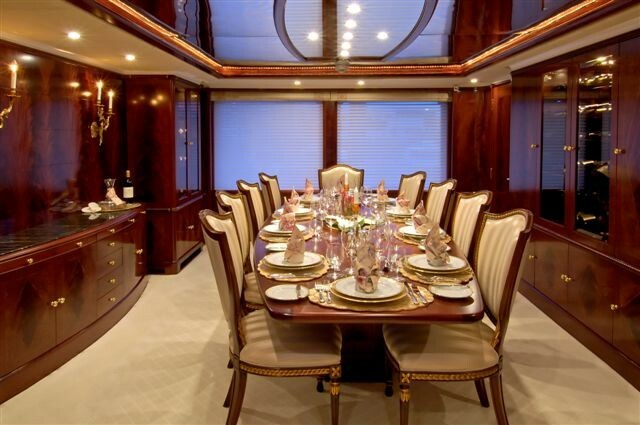 The luxury yacht NOBLE HOUSE displayed on this page is merely informational and she is not necessarily available for yacht charter or for sale, nor is she represented or marketed in anyway by CharterWorld. This web page and the superyacht information contained herein is not contractual. All yacht specifications and informations are displayed in good faith but CharterWorld does not warrant or assume any legal liability or responsibility for the current accuracy, completeness, validity, or usefulness of any superyacht information and/or images displayed. All boat information is subject to change without prior notice and may not be current.